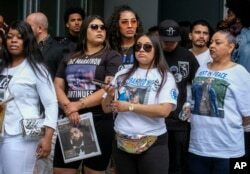 Guests wear T-shirts in tribute to Nipsey Hussle, whose given name was Ermias Asghedom, at the late rapper's Celebration of Life memorial service, April 11, 2019, at the Staples Center in Los Angeles. Thousands flocked to remember the life of Nipsey Hussle at a packed memorial service Thursday that provided mourners with a deeper appreciation of Ermias Asghedom, the man behind the up-and-coming hip-hop persona. Fans of rapper Nipsey Hussle wait in line to attend his public memorial service at Staples Center in Los Angeles, April 11, 2019. Hussle was killed in a shooting outside his Marathon Clothing store in south Los Angeles, March 31. London shared a text message sent she sent the rapper in January calling him “my turn up and my church.” She spoke about learning so much from being in his presence as her provider and protector, but turned sad at the thought of their son being unable to remember his dad. “My pain is for my 2-year-old,” she said. She called him a “superhero” who wasn’t afraid to lead, recounting a story about Ermias at age 9 running down the middle of the street to flag down a firetruck to extinguish her car’s engine that went under flames. Miraculously, the car still ran. “We’re burning but not destroyed,” Smith said. 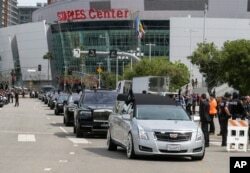 The hearse carrying rapper Nipsey Hussle leaves Staples Center after a memorial service in Los Angeles, April 11, 2019. At least one of the rapper’s wishes came true Thursday. In his 2016 song “Ocean Views,” he rapped about having a Stevie Wonder song played at his funeral. The legendary singer took the stage to perform “Rocket Song,” one of Hussle’s favorites. Cameron then told the audience that Hussle would look at him through the window at times and say “respect.” Cameron then asked the crowd to say “respect” in unison, and the crowd sent the word booming through the arena. Fans of rapper Nipsey Hussle are seen gathered at a makeshift memorial in the parking lot of Hussle's Marathon Clothing store in Los Angeles, April 1, 2019. He charged $100 for his 2013 mixtape “Crenshaw,” scoring a cash and publicity coup when Jay-Z bought 100 copies for $10,000. Last year, Hussle hit new heights with “Victory Lap,” his critically acclaimed major-label debut album on Atlantic Records that made several critics’ best-of lists. The album debuted at No. 4 on Billboard’s 200 albums charts and earned him a Grammy nomination. But the rapper was also a beloved figure for his philanthropic work that went well beyond the usual celebrity “giving back” ethos. Following his death, political and community leaders were quick and effusive in their praise.